I found these appealing magnets at a design store in a delightful mall next to the Recoleta Cemetery. This is a sample of about half the magnets. 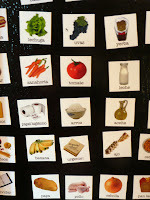 They are designed to be a used as a shopping list but I like them as a graphic element in my kitchen. This is a good example of the kind of souvenir I like on my trips -- something you can put out or on and use. Food themes or cooking utensils are even better.